This executive summary, based on the CIO Tech Poll: Economic Outlook 2018 and CIO Tech Poll: Tech Priorities 2019 research, outlines how current economic conditions are affecting IT spending plans among IT leaders. Specifically, the research examines CIOs’ investment strategies and where IT leaders will be spending their money in 2019. Download the summary for exclusive insights about the technologies that CIOs value most and how their budgets are shifting. How technology budgets are shifting and the economic factors causing these shifts. Which technologies IT executives will be prioritizing in the next 12 months. The top disruptive and opportunistic technologies for 2019 - such as artificial intelligence (AI) and blockchain. 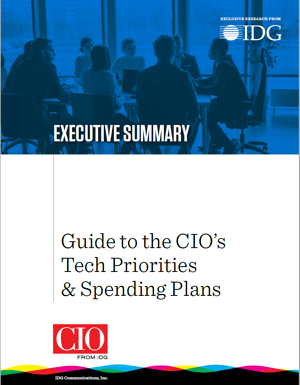 Grab your copy of the Guide to the CIO's Tech Priorities & Spending Plans by filling out the form to the right.